​I am always maintaining a sense of current standards and practice and how that is reflected In curriculum development. If I sense there is an educational gap in a student’s preparation for post graduation I will create a course to fill it. 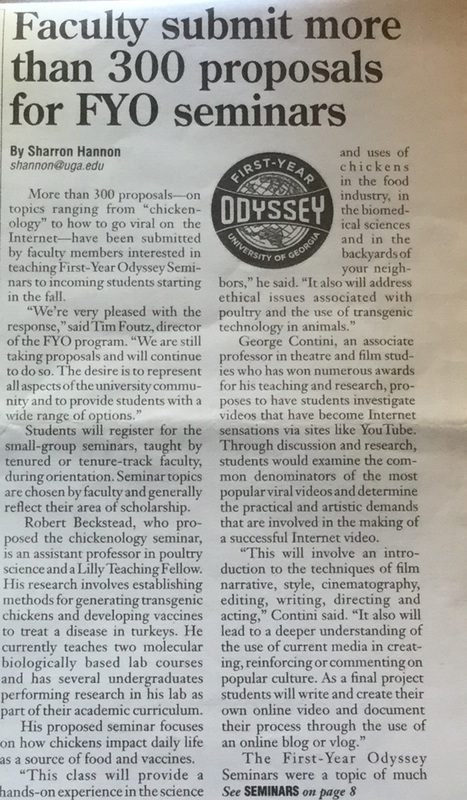 I have created eight new courses in recent years including the Freshmen Odyssey Seminar--Going Viral: What Makes a YouTube Star—this class was one of the very first Odyssey Seminars (article below). When designing the new Odyssey course , I attended the Center for Teaching and Learning Institute on Classroom Assessment. The skills that I developed in those workshops were crucial in my development of the Graduate Seminar in Teaching created for the Graduate Acting Students to prepare them for their duties as teaching assistants. With the onset and democracy of digital technology I sensed that there was a strong interest in Acting on Camera for non majors and created a course specifically for those students. It has never failed to fill up on the first day of registration. Because I have spent 12 of my 16 years at UGA teaching the Undergraduate Senior Exit Seminar, I wondered why a similar class wasn’t in place for the Graduate Acting Students. To fill that void I created The Actor as Entrepreneur providing an opportunity for MFA students to understand how to brand, market, and take charge of their careers. As Director of the London Study Abroad Program I expanded that program to include experiential programming, Internships in London, that provides students with internships at theatre, film, and arts organizations and London Performance Critique which provides students a strong contextual framing and history for the many stage and tv productions they view while in London.